The Halesworth Carpet Shop has expanded. And so we invite you to visit our New Upstairs Bedroom Studio. Discover a skillfully edited selection of the highest quality beds and mattresses- specifically chosen by us from two of the most renowned and trusted British manufacturers, Sealy and Rest Assured. 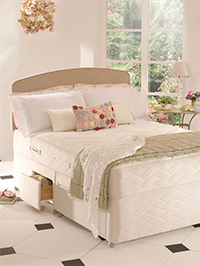 We realise that choosing a new bed can be a rather complicated and time-consuming challenge. So many options, choices and prices await you, so we have eliminated as much of the hard work as possible. Our selection of display models represent the best in modern mattress technology and we have done our homework so that we can offer you the best advice and service levels possible. The Best Way To Buy A Bed. The spacious new Upstairs Bedroom Studio allows you to stretch out on the beds in complete privacy, to test every model properly, and to take the time to discover which bed feels perfect for you. Modern mattresses offer more options than ever before, so if your existing bed has seen better days, or if you are waking up with the aches and pains that old, worn out, or unsupportive mattresses so often promote, then we promise you a beautiful buying experience, and the best opportunity for a blissful nights sleep. And of course, you can order from us any Sealy or Rest Assured bed you may desire- from an extensive brochure or online selection – but the in-store display will give you a very good idea of what to expect from your new bed. 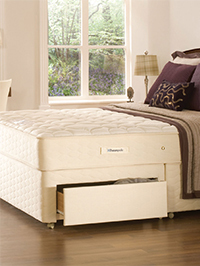 Why not take a look at our bed buying guide.